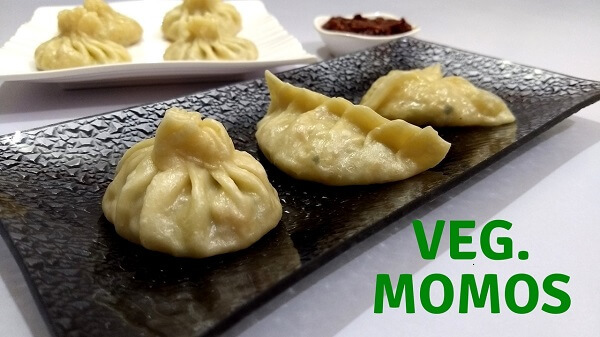 Veg Momos – one of the most popular snack recipes originated in Tibet. Momos are made with sauteed vegetables stuffed in a Potli shaped steamed dumplings. 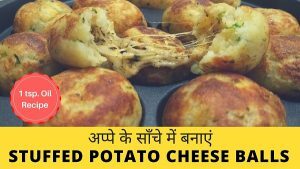 A simple & authentic recipe of Vegetable Momos you can easily prepare at home. “Momo” is the Tibetian name, the same dish is known as “Dim Sum” in China. Take All Purpose Flour in a bowl, add Salt and water as required and make the medium soft dough. After preparing the dough, add 1 tsp Oil and knead again for 1 – 2 minutes. Cover with lid and let the dough rest for 15 minutes. Add Ginger & Green Chillies in hot oil, sauté for 30 seconds. Add Cabbage & Carrot, mix well and sauté for 1 minute. Switch off the gas and add Spring Onions, mix well and let it cool down to room temperature. After cooling the stuffing, add Black Pepper Powder, Garlic Powder and Salt. Mix well all the ingredients and keep aside. Roll each dough into a thin circle of about 3 to 4 inch. Add stuffing at the centre, cover from all the sides and seal to make Momo. Lift the edge from one side and start pleating, join the pleats in the centre (check the video below for instructions). You can also make Momos in different shapes. Prepare all the Momos from remaining dough in the same way. Heat 2 cup water in a steamer, pressure cooker or Kadhai, I have steamed Momos in a Kadhai. Place the momos on a greased plate, keeping space between them. Place a stand in kadhai to keep distance between water level and plate. Cover with lid and steam on high flame for 10 to 12 minutes. Time of cooking Momos varies from the kind of pan/cooker or intensity of the flame. Once steamed, remove from Cooker/kadhai and place momos on a serving plate. Serve Hot Veg Momos with momos chutney or Schezwan Sauce.